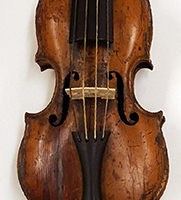 A Stearns violin on display at the Cancer Center. The Stearns Collection of Musical Instruments within the U-M School of Music, Theatre & Dance is one of the largest accumulations of historical and contemporary musical instruments housed in a North American university. Known internationally as a unique collection, it is not only a precious heritage from the past, but also a rich resource for musical, educational and cultural needs of the present and future.